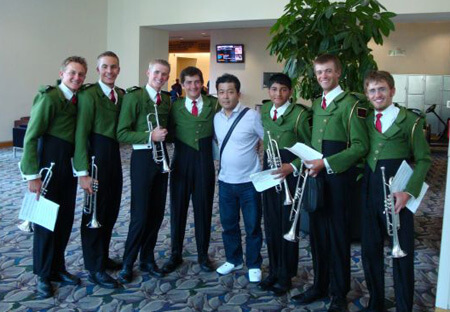 Waratu Haraguchi, a member of the Sonic Lancers Drum & Bugle Corps in Japan, submitted this photo and caption. From Japan, I was able to go to the DCI World Championships this summer which is my life-long dream. The photo is of me with the Madison Scouts taken during the Individual & Ensemble Competition at the Indiana Convention Center in Indianapolis. I have been a big fan of them for a long time. I treasure this photo as my most precious memory during the tour, and I would like to express my gratitude toward the Madison Scouts members.